buttery croissants (brioche) filled with marmalade, chocolate chips, Nutella or custard cream. meringues (meringhine brutti e buoni), small fun-sized meringues are imperfectly shaped and a burst of delicious melt-in-the-mouth sweetness to taste. Also try the traditional dessert meringata. 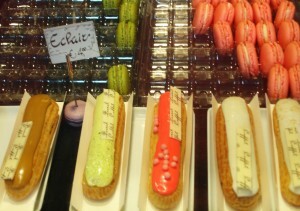 mini patisserie (pasticcini) daubed with a generous spread of white, pink or brown icing and filled with custard cream. rich chocolate, fruits of the forest and Chantilly cream gateau. ice-creams (gelati), come in a variety of traditional flavours including chocolate, coffee, cream, yoghurt, stracciatella, strawberry, lemon, pistachio, chestnut (in autumn) and gianduja. carnival sweets (bugie): choose from those filled with jam, marmalade, Nutella or crumbly sugar coated fritters in the month of February. Easter Dove cake (colomba) containing candied fruit and studded with pearl sugar and almonds. 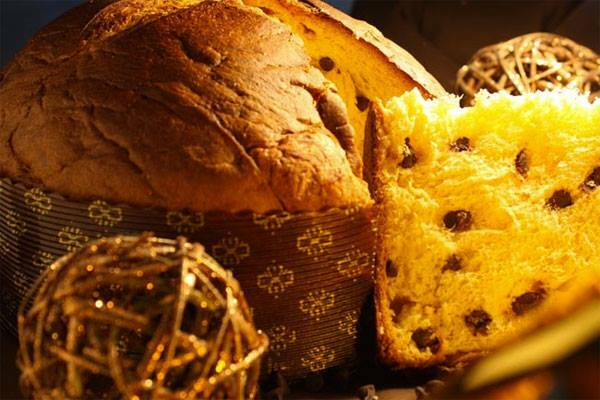 Panettone, the traditional sweet bread loaf served at Christmas time containing raisins or the icing sugar sprinkled Pandoro. 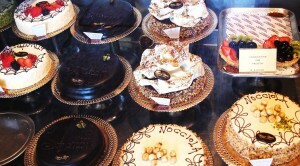 Savoiardi, Novarini, Garibaldini, Torcetti, and Baci di Dama. Savoiardi are long, soft, sweet sponge biscuits first made in the fifteenth century in the Kingdom of Savoy, in honour of a visit by the King of France. Over the years, they became a firm favourite of the court, much enjoyed by children and often given as gifts to royal visitors. 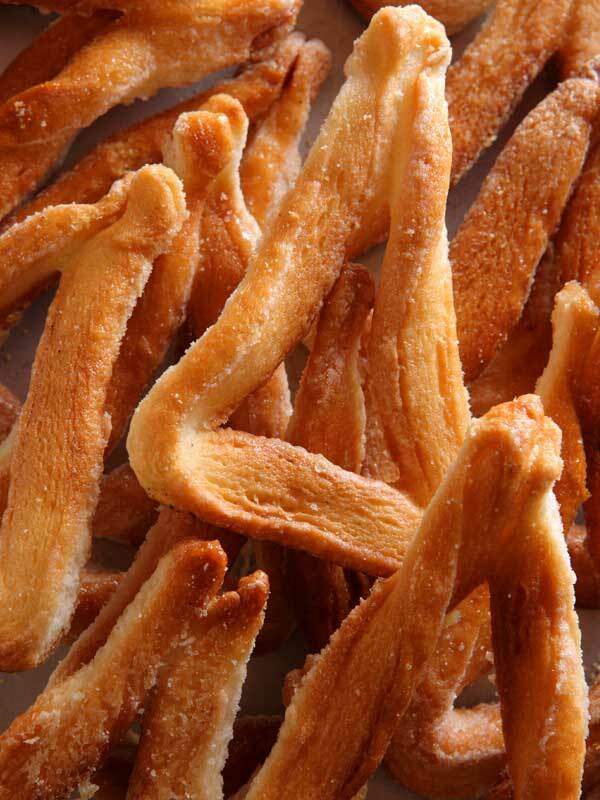 Shaped like long, elegant fingers, these light biscuits are used in desserts such as tiramisu or make a great accompaniment to a cup of hot chocolate or Bicerin. 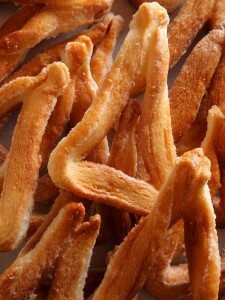 Similar biscuits for dipping include Novarini and Granellatti, other classics from Piedmont; the former nipped in at the waist and sprinkled with a light confetti of glazed sugar, and the latter topped with pearl sugar. Garibaldini biscuits have more of an air of fun and frivolity about them than their elongated cousins, and are more suited to munching than delicately dunking in chocolate drinks, coming sprinkled, sandwiched or topped with either sultanas or apricot jam. Torcetti are also full of spirit and look enticingly like donut rings from a distance, but are, in fact, a biscuit, with a delicate vanilla taste and a wonderful aroma. Finally, Baci di Dama, bite-sized biscuit clusters are nutty, buttery domes, with a hazelnut cream kiss. 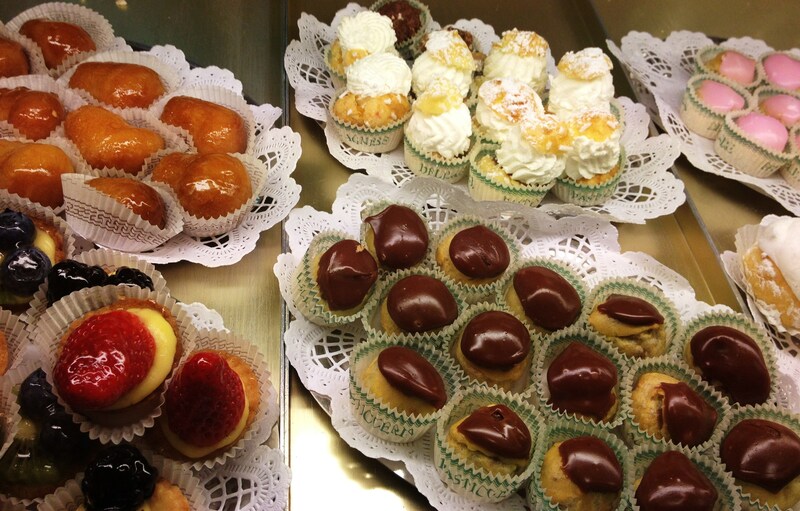 There are many places to enjoy delicious desserts but be sure to stop by Baratti & Milano, Gerla 1927, Stratta and Caffe Platti on Corso Vittorio Emanuele II to sample some of the best pastries in Turin. For gelato, go to Fiorio, famous for its gianduja (chocolate creamed with hazelnuts) inspired by the local Commedia dell’ Arte character of the same name. 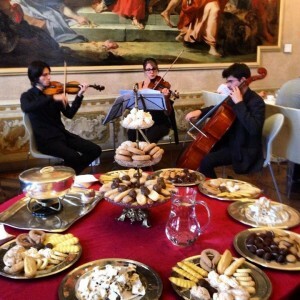 Pepino, located in Piazza Carignano, is famous all over Piedmont for having invented the delights of chocolate covered ice-cream on a stick, locally referred to as Pinguino (Penguin), and Silvano Gelato d’altri Tempi does a brisk trade in home-made gelato. 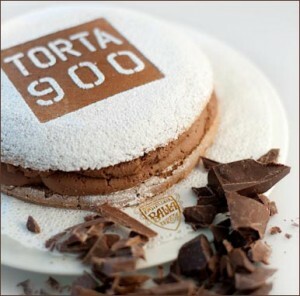 And just outside Turin in nearby Ivrea you can sample the locally made Torta 900, from the famous Balla pastry shop. A slice of chocolate heaven, this rich, gluttonous cake was first created in the late nineteenth century, with a secret recipe to boot. Two famous brands of mass produced cakes and sweets from Turin itself include Ferrero, founded in Alba in 1946 and producer of the internationally renowned Tic-Tac and Nutella. It also manufactures a range of sponge cakes that are a firm favourite for children’s afternoon snack time (merenda). Pastiglie Leone, founded in Alba in 1857, was once supplier to the Savoy royal family of its famous pastel coloured buttons (the ‘violets’ are also said to have been a favourite of Camillo Cavour). Other sweet products include candied jellies, fruit gums, and licorice. 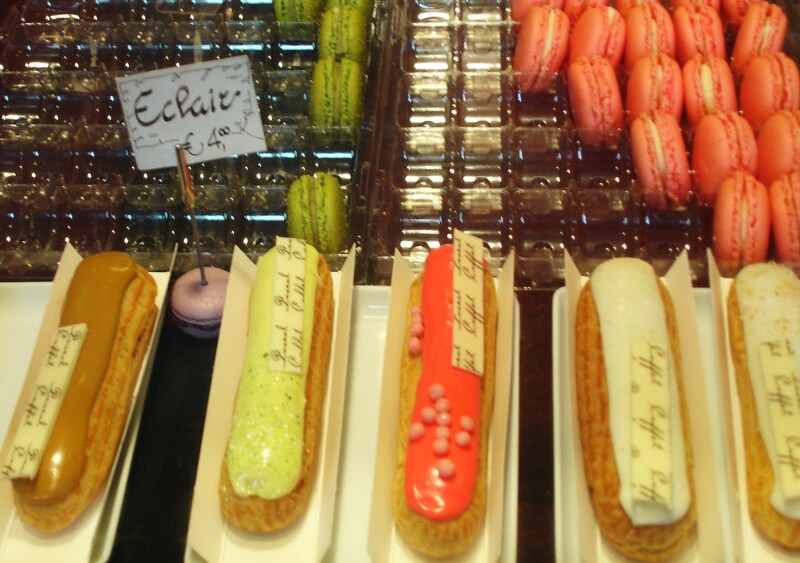 So here’s your own foodie guide to desserts and pastries to help you indulge on Italian pastries, desserts and specialties from Turin and the rest of Piedmont during your next trip! And if your sweet tooth is still not satisfied (which would be hard to believe) escape to Turin’s Chocolate Heaven to discover the city’s chocolate tradition.